What happens when you combine several good things into one? In this case you get one great thing - Jason, Chris and Collin. Separately they are talented musicians and vocalists, but together they form a unique blend that stands heads and shoulders above the crowd. Together they form 33Miles. The trio boasts a fresh new sound that combines their varied influences into an intriguing musical blend that shouts their destiny, "...to love on God's people." Each member is an accomplished vocalist, songwriter, and musician in his own right, but together there's an electricity and passion that comes from a shared sense of purpose. "We know why God brought us together," says Chris. "We really believe that God has called us to the church. We feel like we've been called to remind the church and ourselves of who we are in Christ and whom we serve. As Christians, we have grace, mercy and power beyond comprehension and understanding. We just want to encourage the church to look to Jesus. Don't forget who you are in Christ." This purpose is reflected in their name, which is a simple metaphor for the 33 years that Christ spent on Earth, and how He lived them. "He was a friend to the friendless, He loved the unlovable, and He gave of Himself selflessly by dying on the cross in our place so that we could live forever," Jason explains. "We want to follow Christ. We want our 'Miles' to have purpose and meaning and to make a difference for the Kingdom of God . We aren't promised a certain number of miles, so what are we going to do with the "Miles" that we are given?" Good news travels fast in Nashville 's music community and as word spread that Jason, Chris, and Collin had formed a new group, the doors began opening. The trio signed with INO Records, home to other artists such as MercyMe, Sara Groves, Derek Webb, and more. As they began working in the studio with acclaimed producer Nathan Nockels (Phillip, Craig & Dean, Watermark, Passion) and hot newcomer Sam Mizell (Jessie Daniels, RJ Helton, & Matthew West) the group's singular sound emerged. The album is a simple message that conveys the heart of 33Miles. While combining pop, rock, country and worship moments, 33Miles attracts a diverse group of fans encompassing a wide range of ages. "I think a lot of it is because we do take all our influences and put them together," says Jason. "I think harmonies are something that people love, but you don't see a lot of it in pop music, you see a lot of it in country and gospel, but when you put three-part harmony into pop music, fused with everything else, it creates a sound that's more universal than anything. That's what makes us a little different from everyone." 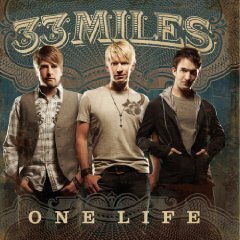 Musically diverse and innovative, 33 Miles has a sound that immediately engages the listener with great vocals and memorable melodies, but the essence of what drives these three young men is the heart of the music and the message of God's love and mercy.